What Ecommerce platforms does GoSquared integrate with? Note: The Ecommerce dashboard is now only included with our Enterprise Plans. Current Ecommerce customers can continue to use their dashboards with their existing plans. New customers should contact sinead@gosquared.com to learn more about our enterprise pricing options. These instructions are for connecting your Wordpress site to GoSquared using the 3rd party data connection service, Segment. It supports GoSquared Analytics, Live Chat and People CRM out of the box. Note: most users will be better using the official Wordpress plugin without the need for Segment. Segment is a customer data hub for easily managing multiple services running on your website. Its a great way to glue different services together and is currently our most reliable method for WordPress tracking. Do I need to pay extra to use Segment? No. GoSquared is part of Segment's free 'Developer' tier. If you have less than 1000 unique visitors a month (what Segment calls MTUs), you wont have to pay Segment anything extra! Install the Segment plugin on your WordPress site. If you haven't already, sign up for a free Segment account. Follow the instructions on Segment's website to create a new project for your store/blog. Open the project and click 'Project Keys' in the sidebar. 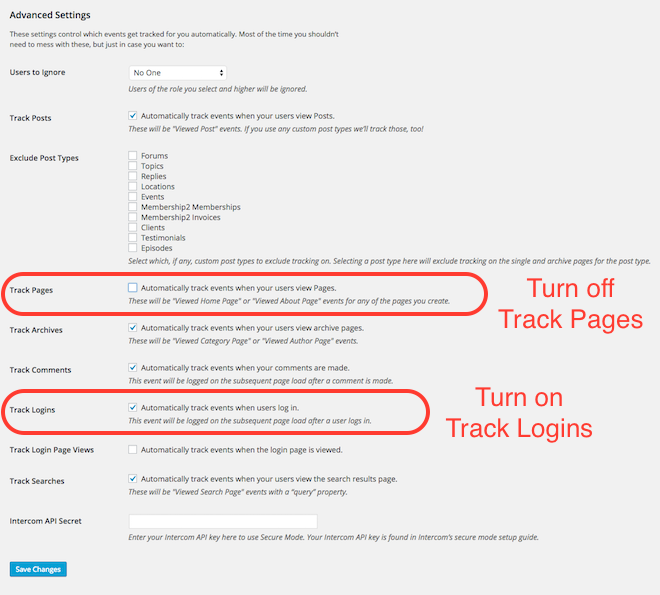 Copy your Write Key and paste it into your analytics settings by going to Settings > Analytics in your WordPress admin. Turn off 'Track Pages' (GoSquared already tracks pageviews, leaving this on may create duplicates). Turn on 'Track Logins' (this enables People CRM). Segment is now installed on your site. Next we need to get Segment talking to GoSquared. If prompted, login to your Segment account. Then select your store project from the dropdown menu and click 'Send Data'. GoSquared will verify your data is tracking (try refreshing after a few minutes if it doesn't work). That's it, you're done! No more coding or tweaking required! The Segment plugin automatically collects some important Ecommerce events. No code is needed for it to work. Check out the docs for the standard plugin for more information.